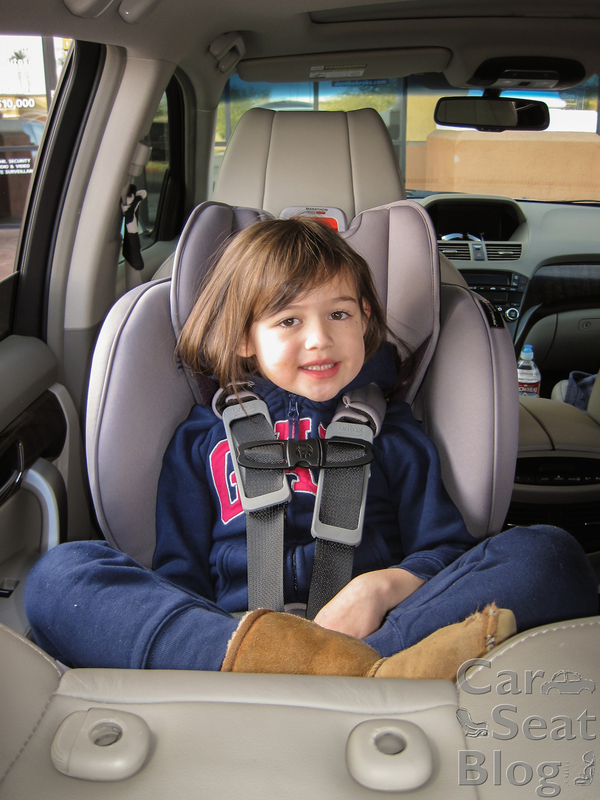 ClickTight isn’t a new-new technology anymore, since it was introduced on the Frontier and Pinnacle combination seats almost 5 years ago, but what *is* new is how it’s being applied to Britax’s convertible carseats. 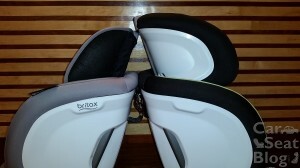 Britax has taken ClickTight and made it so that it takes seconds to install a ClickTight convertible seat. 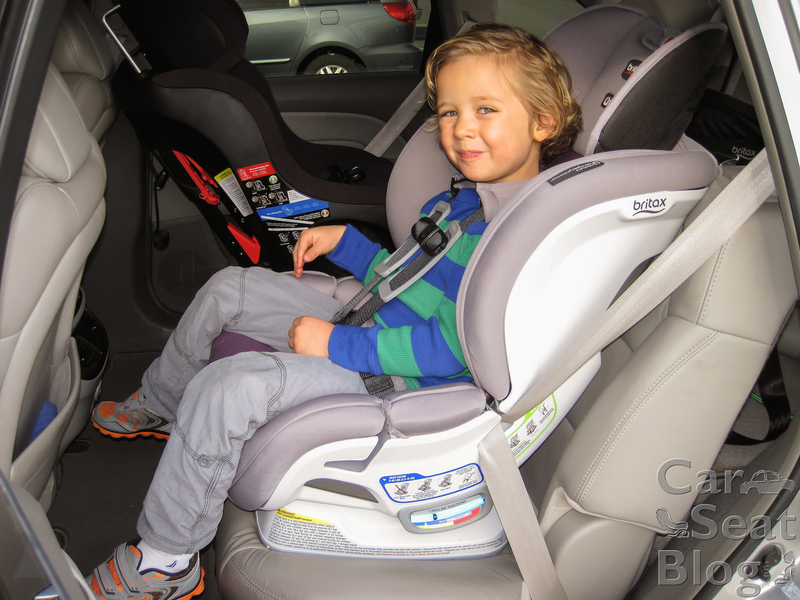 The new Britax Marathon CT is a Euro-styled, well-padded carseat designed to fit newborns to preschoolers. Here’s a quick overview of the differences between the three new ClickTight convertibles. All Britax CT convertibles have the ClickTight Installation System, an impact-absorbing base with 7 recline positions, rip-stitch energy-absorbing tether, HUGS harness pads, a steel reinforced frame, EPP foam, and other side-impact protection features. 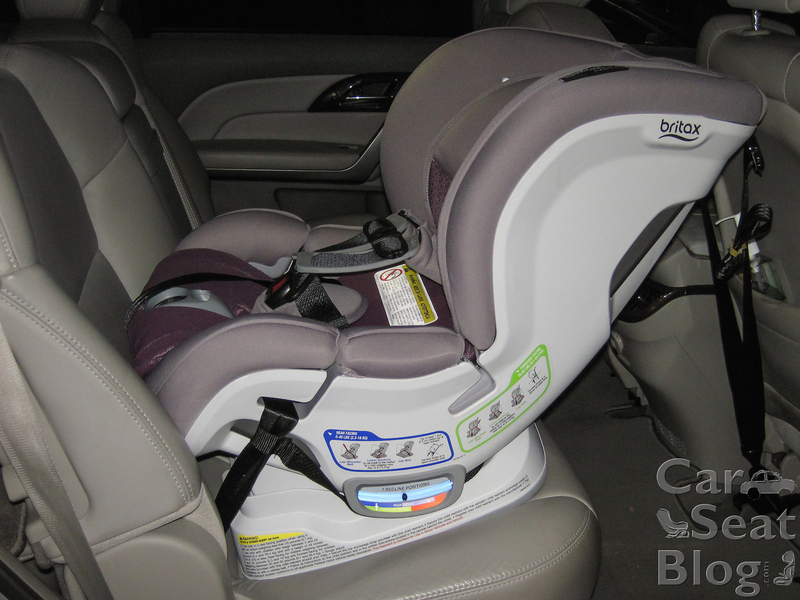 Britax also markets a less expensive series of smaller convertibles. We recently reviewed the Essentials by Britax Emblem that sells for $239.99 at Amazon. No lockoffs! What? I am celebrating no lockoffs from the brand that introduced lockoffs to the American public? Yep. It actually has the ultimate seat belt lockoff in the ClickTight panel, which closes down on top of seat belt, locking it. The panel unlocks by pushing the dimple at the top of the CT dial and turning it clockwise. Recline: There are 7 recline positions for rear-facing and as long as you stay within the proper zone for either your rear-facer or forward-facer, you’re golden. I wish there were one more for my 2011 MDX, but I could have used a noodle to get there. I don’t have a steep back seat, but I was 1 recline position away from being where I think a newborn should be. The Marathon can be adjusted as upright as you want for rear-facing as long as the level indicator ball isn’t touching the edge, which is fantastic for those older kids who don’t sleep, and it gives front seat passengers more legroom. For forward-facing, the MA provides a nice recline as long as you stay within the indicator’s forward-facing zone AND the base isn’t pushed more than 3” off the vehicle seat. This recline is nice for kids who have special needs or if you’ll be traveling on a long trip overnight, but it really cuts down on the child’s legroom if you put it at the most reclined. Leg injuries are quite common in forward-facing children because their legs get smashed into the front seat in a crash, so put the seat as upright as possible for your child. Seat Belt: Installation with the seat belt is easy peasy. Probably the most difficult part for me was threading the seat belt through the slots and into the belt path because the cover has so much padding that it impeded the belt going in. So I had to wiggle the belt a bit—it’s better than my hand not fitting in the belt path, getting permanent scars from scratches and skin scraped off my hand, fighting with lockoffs that don’t want to stay closed, and so on, that I’ve dealt with on other seats. Simply pull the slack out of the lap belt, make sure the seat belts are laying flat, and close the ClickTight panel. If the MA moves more than 1 inch, remove more slack from the seat belt. If it takes you more than a minute to do this process, there’s something wrong. But I’ll cut you some slack if it’s the first time you’re installing the seat 😉 . 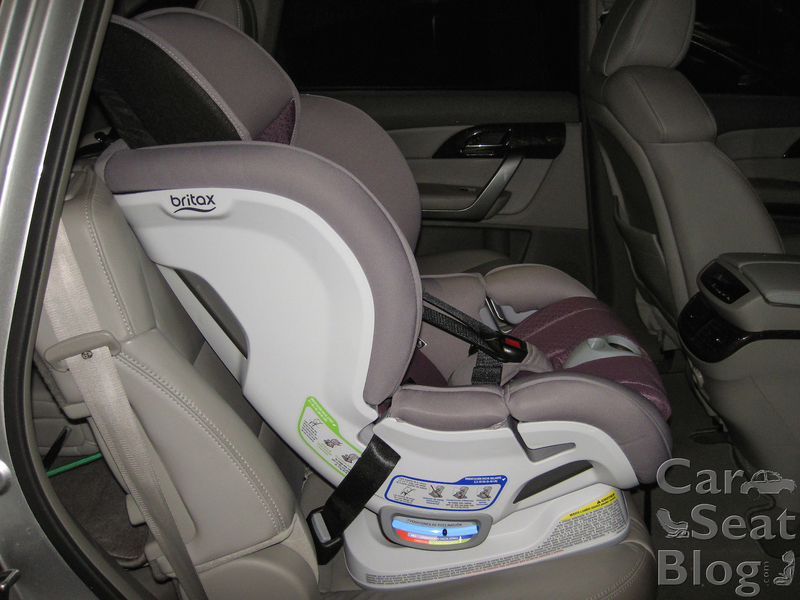 LATCH: Britax almost scoffs at LATCH with the CT system, especially in these convertibles. Gone are the deluxe push-on style lower connectors with which Britax has spoiled us and in their place are standard clip-on style connectors, just like what’s found on the end of the tether strap. Huh. They’ve done this for 2 reasons: 1. to save storage space and weight on the seat, and 2. to discourage the use of the lower connectors. 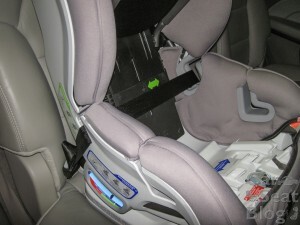 With the new LATCH regulations that have gone into effect, lower anchor weight limits have been drastically lowered on some carseats (heavy ones, like Britax seats) and since it’s so incredibly easy to install the CT carseats using the seat belt, it makes sense to discourage the use of the lower LATCH connectors. 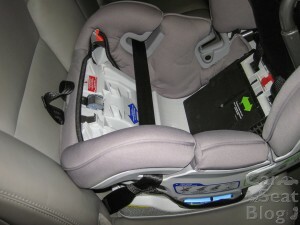 Of course, there are always times where you might want to use those connectors—when you have a passenger who might click open the seat belt and uninstall the carseat—is one instance that immediately comes to mind. The lower LATCH connectors are stored tidily in a small compartment on the back of the base. But does the switch to the clip-on style LATCH connectors make installation with LATCH difficult? Heck no! 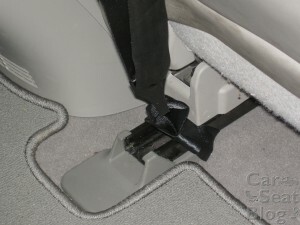 Many of us have experience with the clip-on style lower connectors because they came on our rear-facing only infant seats, so it’s not new technology. Just clip on, making sure to always put the LATCH belt through the child’s left side of the seat, pull the slack out of the belt, and close the ClickTight panel, just like when utilizing a seat belt install. The only thing to watch out for is the weight limit. Rear-facing LATCH weight limit: 35 lbs. Forward-facing LATCH weight limit: 40 lbs. 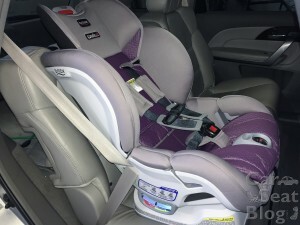 Britax only allows lower LATCH connector installation of their ClickTight convertible models in the center seating position when the vehicle manufacturer has designated it as a LATCH location. 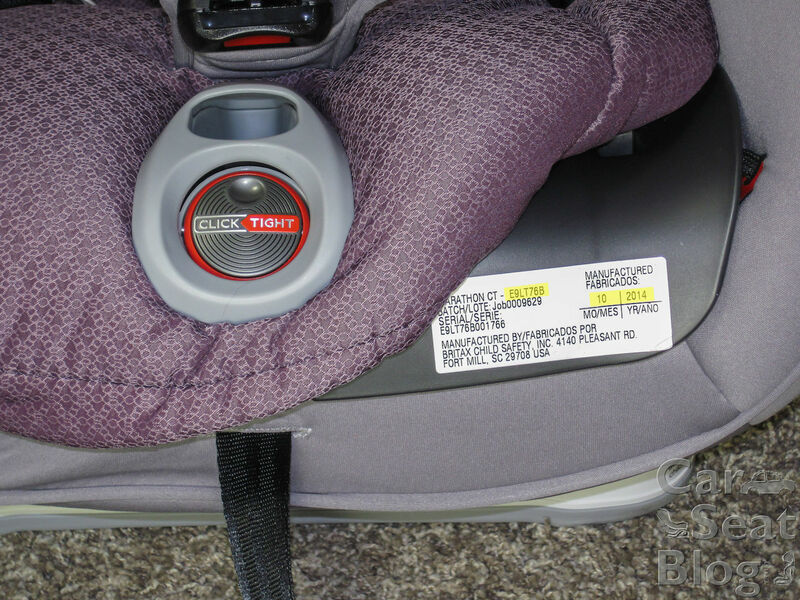 Britax has determined that the Marathon ClickTight cannot be installed with inflatable seat belts found in some Ford, Lincoln, and Mercedes vehicles, and in some airplane seat belts. The tether on the ClickTight models has been shortened significantly. If you’ve had a Britax convertible or combination seat before, you know that the tethers on these seats have been so long as to be able to fit in the car behind you—in fact, people have run over the excess tether webbing that accidentally fell out a door. I found the new MA tether to be just long enough for me to tether rear-facing in my 2011 Acura MDX and have a little left over. I had plenty of tether length for tethering forward-facing to my seat backs. Because it has been shortened so much, Britax offers tether extenders in case you need them in your vehicle. When you call customer service, 1-888-427-4829, with your date of manufacture and model number, you will be asked if you want a rear-facing extender or forward-facing extender. The rear-facing extender is 3” shorter than the forward-facing extender—16 ½” vs. 19 ½”. If you’d like information about tethering rear-facing*, we’ve got a blog written all about how to do it. The most popular style of rear-facing tethering is Swedish style and Britax includes a tether connector strap for creating a tether point to set this up. We can’t really call this a D-ring anymore because this strap is all webbing now; there’s no more D-ring attached to one end. To be honest, I nearly threw the thing across the street in frustration trying to attach the tether hook to it until I followed Jennie’s advice (from her Boulevard CT review) of folding the loop into thirds and then clipping the hook on. Worked like a charm—thanks, Jennie! 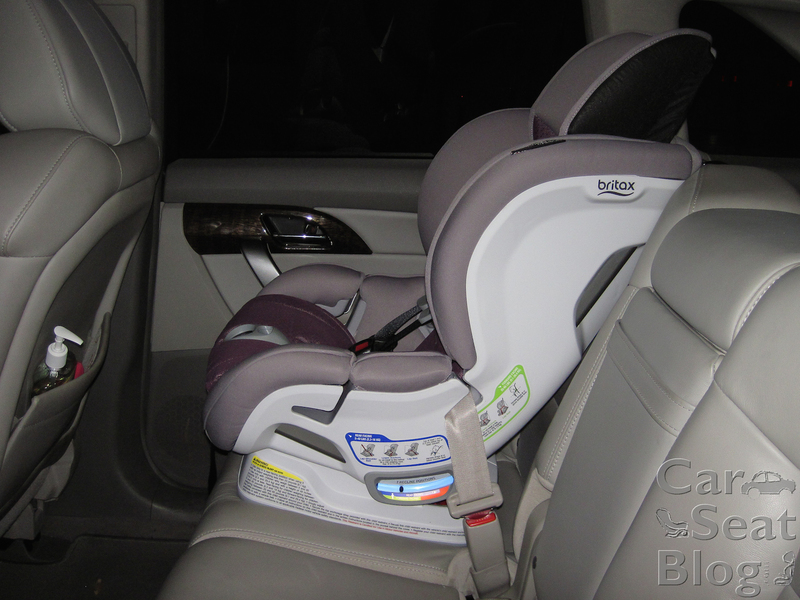 *UPDATE: Britax changed their stance in 2015 and rear-facing tethering is no longer an option with their new convertible carseats. Now an anti-rebound bar is available as an accessory (sold directly from Britax) which serves the same purpose and function as a RF tether. 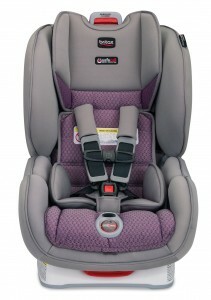 The Marathon CT comes with an infant insert, which puts the lowest harness position at about 7.5”. Fit to Romeo, my 20” newborn doll was good and made even better by taking off the standard rubber HUGS pads, which are optional rear-facing, but mandatory forward-facing. Because the back of the MA is entirely closed, threading the harness ends back through to the metal splitter plate after removing the HUGS may seem tricky, but it really wasn’t. There’s a metal tube visible through the harness slots in the front that the harness is fed over from the front. A different tube is visible from the small opening on the back of the seat. Simply feed the harness over both tubes; the harness will come out the back of the seat to grab and you’re ready to reattach it to the splitter plate. The infant insert, called the “comfort pillow” in the manual, is nicely designed to fit under the tuck in the back pad when it’s in the lowest position. 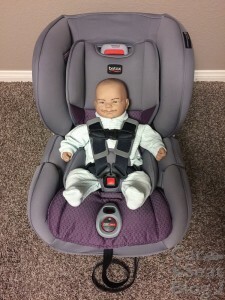 There are no weight or height limits on its use, but I would remove it as soon as the child no longer needs it for a boost to the bottom harness slots. 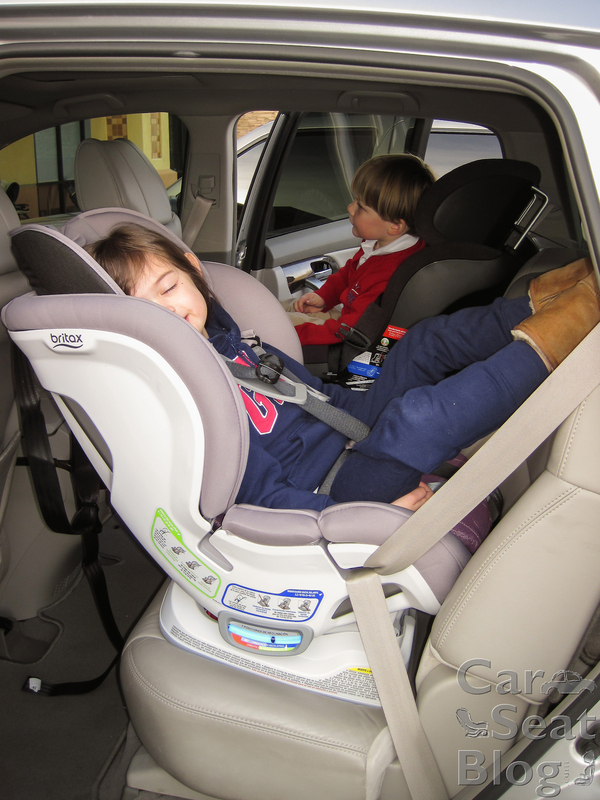 A very common sight we see at checkup events is kids crammed into carseats that are seemingly too small because they still have infant inserts in them. 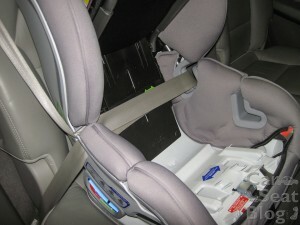 Once the inserts are removed, the children are much more comfortable and have more room to grow in their carseats. Older children will find the MA very comfy too. 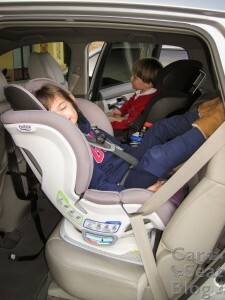 My models, ages 4 and 5, loved the seat and said it was very padded. My 5 year old model sat comfortably rear-facing in the MA for about 15 minutes while waiting for me. Quinn is 4 and weighs 44 lbs. Addie is 4 and weighs 43 lbs. Ava is 5 and weighs 38 lbs. 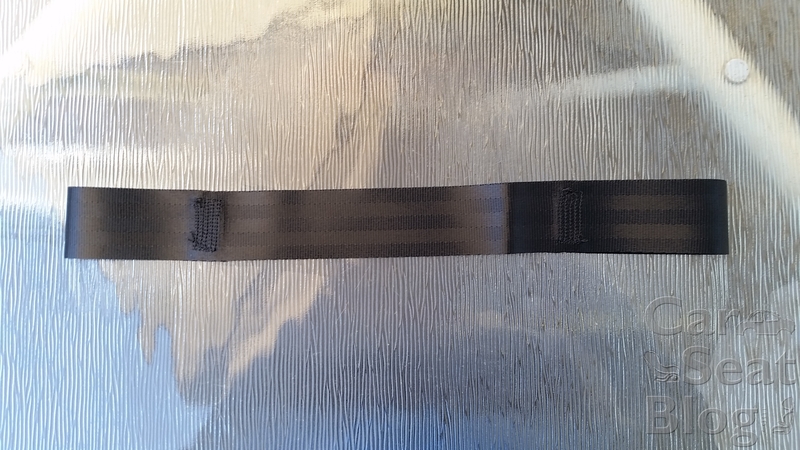 Update: If you open your ClickTight panel and see a metal plate at the buckle slot instead of the white plastic plate, your crotch strap is longer. This was a running structural design change Britax made in August 2017 and buckles are not interchangeable. The cover is in 4 pieces so you can pick and choose which part to wash, and is easy to remove and put back on. 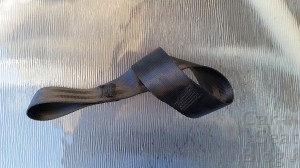 There are relatively few elastics to hold it on and the hard part is remembering to tuck it in all the way around, though a couple of the elastics that hold the front edge piece on are tricky to get attached. There’s no need to remove the harness (yay!) to take off the back portion for cleaning. Most important to remember is to tuck in the side cover where the CT panel locking mechanism can catch. There are red tabs and even warnings on the panel itself about tucking in the cover. Instructions for cleaning the cover are to hand wash with mild soap and water and to line dry. The cover is very padded and I suggest rolling it tightly in an absorbent towel to get the extra wet out before hanging to dry. Also different is where to find the date of manufacture (DOM) and model number sticker. Britax has long had the sticker on the top outside of the shell next to the child’s left ear, but it’s moved to the front of the CT panel, under the cover. You’ll want to know where this is because if you contact Britax with a question, they’ll ask you the DOM and model number. The Marathon CT is FAA-approved; however, because of the unique belt path and the different seat belts airplanes use, installation is altered. 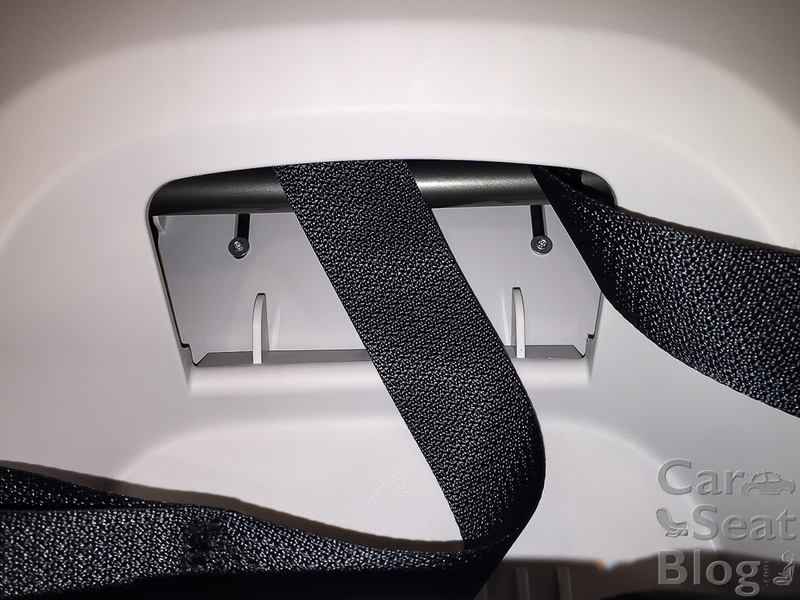 For rear-facing, keep the ClickTight panel closed and run the airplane seat belt over the top of the cover in the rear-facing belt path. Pull tight. 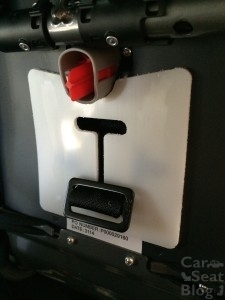 For forward-facing, keep the ClickTight panel closed and run the airplane seat belt under the cover (pull the seat pad back forward) before placing the seat belt in the forward-facing belt path and tightening. Think about it: this keeps the bulky latchplate from being directly on your child’s back. 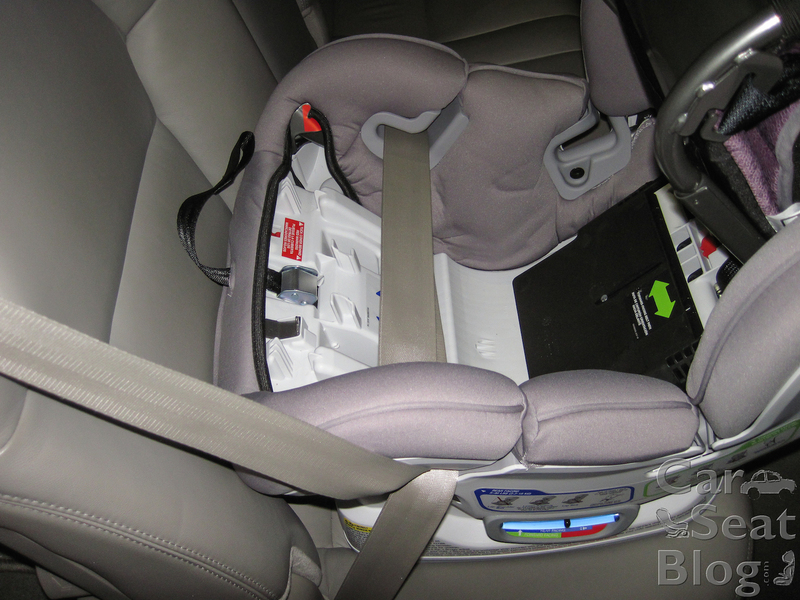 The Marathon CT has a lifespan of 10 years and Britax follows NHTSA’s crash guidelines of replacing after a major crash only. I thought I’d include a troubleshooting section specific to ClickTight carseats. Because they’re different than the average carseat in installation, different situations may pop up that leave you scratching your head. Stuck CT panel: There’s probably too much tension on the seat belt/LATCH belt or the cover didn’t get tucked in behind the red tabs. Unbuckle the seat belt, then turn the CT dial. Try pressing down on the CT panel as you turn the CT dial. Don’t install the seat so tightly. 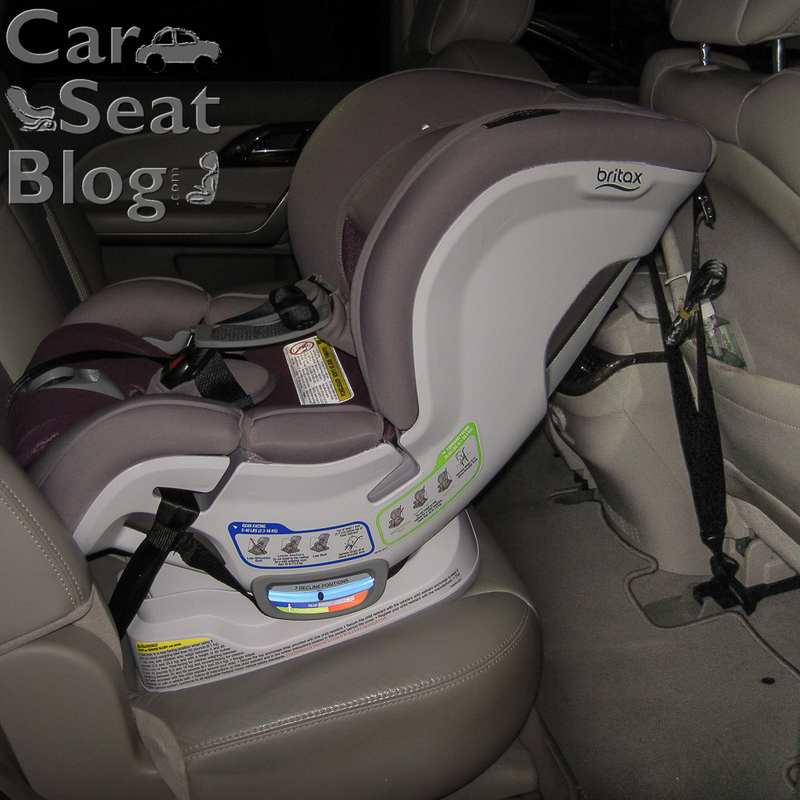 Hopefully you’ve read this *before* installing your CT carseat! You can feel the tension on the seat belt/LATCH belt as you’re closing the CT panel and if it feels like you’re going to have to use your weight to get it closed, the belt is too tight. Loosen up a bit. Try to gently press the cover down on the sides as you lift the CT panel up, then tuck cover in behind red tabs. You’ll probably need 3 hands for this. Harness different lengths: There can be multiple reasons for this problem. The harness is attached to the CT panel in its shortened length on one side and its long length on the other side. Take the harness off one anchor and match it to the other side. The harness got caught in the CT panel on installation. Open the CT panel, and while making sure the harness is out of the way, close it again. The harness is loosened all the way and somehow twisted behind the seat. Raise the headrest all the up and pull the harness tight. Then slowly lower the headrest back into position, pulling the harness tight as you lower the headrest. 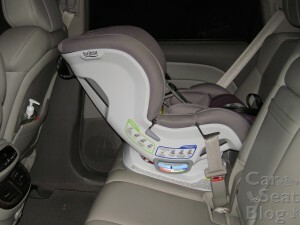 Doesn’t take up a lot of room rear-facing if installed more upright for an older baby or toddler. This makes it a good option for smaller cars and for tall parents who may need to have the front seat all or most of the way back. Despite not having the more robust headwings that the Boulevard CT and Advocate CT models have, two models that we include on our Recommended Carseats list, the Britax Marathon CT shouldn’t be discounted in the winning lineup Britax has with the ClickTight technology. It’s a great option for children who aren’t in the 90th percentile for height or for parents who aren’t interested in rear-facing until their children reach grade school. 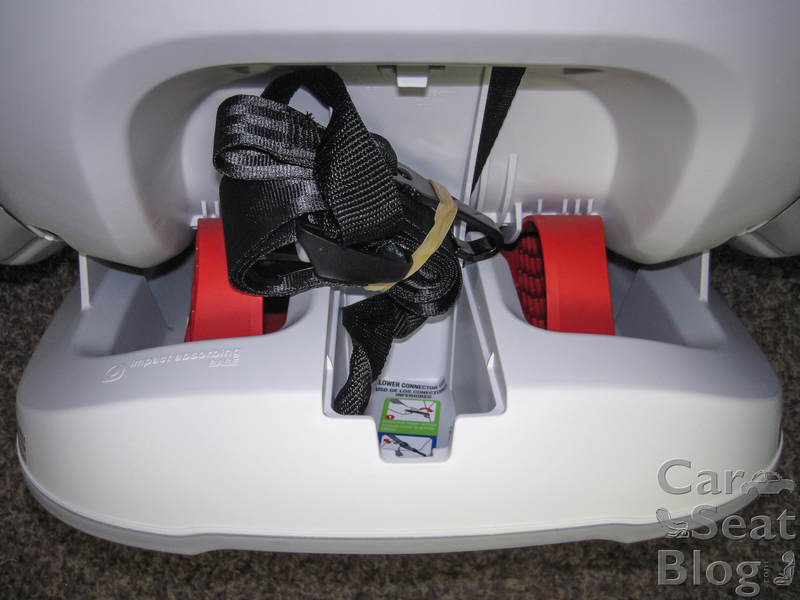 The ClickTight panel makes installation a breeze; as long as you thread the belt through the correct belt path, the carseat practically installs itself. Does the ClickTight system live up to the Game Changer hype promised when it was released last fall? Yah-huh, you betcha! * Editor’s Update: Rear-facing tethering no longer permitted for ClickTight covertibles made on or after January 28, 2015. You know you want one now. You know you do. I’m such a tease ;). I guess you’ll just have to stick around a bit longer to see what we have up our sleeves next week . . . Thank you to Britax for providing the Marathon ClickTight used for this review. No other compensation was provided. All opinions expressed are those of CarseatBlog. But does the switch to the clip-on style LATCH connectors make installation with LATCH difficult? Heck no! Many of us have experience with the clip-on style lower connectors because they came on our rear-facing only infant seats, so it’s not new technology. I like your review…except this part. This style of latch is rubbish. It is extremely difficult to unlatch and move the car seat. The friction lock on the side of the seat is incredibly difficult to loosen. Which makes the latches nearly impossible to release from the car properly. Especially with my man-mits. Britax did this for one reason and one reason only. To save money. I am not a fan of that feature. What’s your opinion about the Consumer Reports finding that the harness straps pulled through the shell on the Boulevard CT but not the Marathon CT with a 62 lb dummy? Do you think, pragmatically, that the Marathon is safer, or at 62 lbs will most children be out of a convertible seat anyway and into a booster? 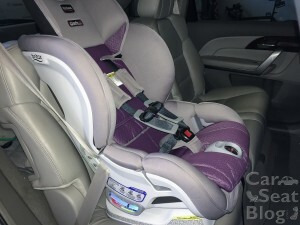 I’m asking because I just got new Maxi Cosi Magellan Max seats after my infant outgrew her infant seat, but I am finding it extremely difficult to get the harnesses as tight as I would like. I called Maxi Cosi but so far they haven’t been much help. The Magellan max harness path is enclosed in the new design, so I can’t reach to the back of the seat and pull the harness tight from the back to facilitate tightening it. 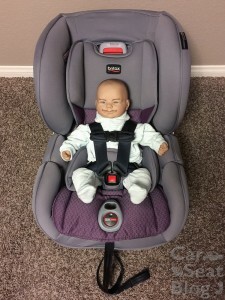 I am thinking about just replacing the seat with a Marathon CT but my child is currently in the 99th percentile and expect she will be tall and am wondering if the higher harness adjustment positions on the Boulevard are worth it, vs just going with the Marathon CT if Consumer Reports thinks it’s safer. CR rates the Marathon CT higher than the Boulevard CT at “better” and “basic” respectively in terms of safety. Hi Alan. Since Britax raised the top harness height limit of the Marathon CT to be the same as the Boulevard CT, it will theoretically have the same testing issues as the BV CT in CR’s test. You’ve hit the nail on the head in terms of what our experience is with older children and convertibles is: most kids outgrow their convertibles forward-facing by height before weight. Of course, kids come in all shapes, so there will be outliers, but the majority won’t make it to those top harness slots at 62 lbs. and still fit comfortably in the seat. If your daughter outgrows any convertible seat before you feel she’s ready for a booster seat, there are currently lots of forward-facing combination seats (harnessed seats that convert to boosters) on the market with more likely to come later. Hello, I have a marathon clicktight for my 2 year old. The instruction manual and website say the height limit is when the child’s head is 1” below the top of the “head rest”. Does this mean the top of the shell of the seat or the top of the adjustable center piece? Brittany, the top of the center adjusting piece. 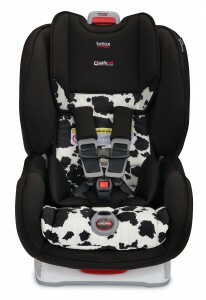 We’ve clarified that with Britax in the past since it’s a bit murky. Hello! Our Marathon CT was in our car with the windows down when the inlaw’s sprinkler system turned on. Everything got pretty wet, but we dried everything best we could and set it in the sun for the day. I’ve tried contacting Britax but was on hold for 35 minutes before the line disconnected. Could you tell me if the straps need to be replaced or not? Hi Sara. For bigger kids, the Marathon CT isn’t the best choice because it does have shorter top harness slots than the Boulevard or Advocate CT models by about 2″. The Marathon CT harness slot heights are about the same as the G4.1 models (MA/BV), so you won’t get any more height there, but the G4.1 models do have longer crotch straps. The crotch strap length does bother some kids and not others, so it is completely a kid-by-kid issue. Thanks for doing this review, it is very helpful! I am a little confused as to why the marathon did not make it onto the “recommended” list. I’m trying to decide what convertable to go with right now, but I’m a little lost. The marathon seems cheaper than the boulevard and advocate, but we don’t want to skimp on safety. I’ve read so many reviews and safety is our top priority but we were hoping that it wouldn’t break the bank. Advice? Hi Emma. The Marathon is less expensive because the harness doesn’t go quite as high as the Boulevard and Advocate and it doesn’t have the headwings that the other seats have either. 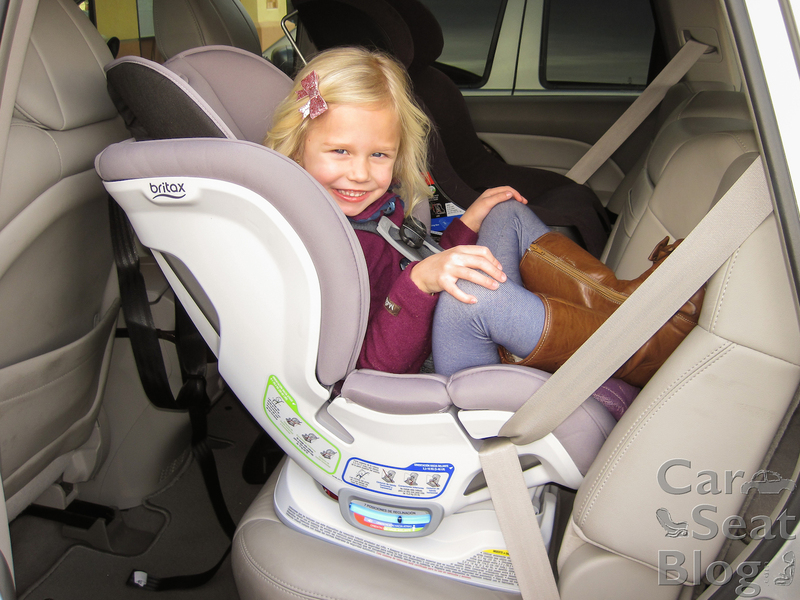 It didn’t make the Recommended Carseats List because it is so similar to the other 2 seats and we’d end up with a huge list—we had to draw the line somewhere. We have 2 Marathon Clicktights (twin 5 year old grandsons). 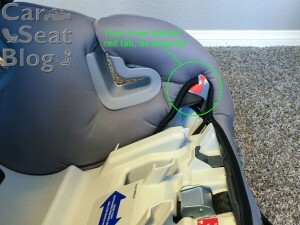 When using the latch connector method, even when i push in the lower connector adjuster release button to loosen the lower connector strap to be able to remove the car seat from the car, i can’t get any of the strap to loosen up. this is true of both of the Marathon CTs we have. Am i doing something wrong? Maybe you’ll say we should just use the shoulder/lap belt method? Thank you. Hi Don, this is a common issue, unfortunately, with the ClickTight models. For this reason alone we recommend ONLY using seatbelt to install your ClickTight seats. If you cannot get the LATCH strap to loosen – call Britax customer service and ask for their blessing to cut the strap. That will mean you have to use seatbelt from now on but you probably want to do that anyway. 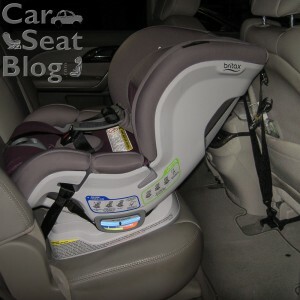 There is no benefit to using LATCH to install these seats and as you’ve discovered, there is actually a significant downside when it comes time to uninstall the seats. For what it’s worth, the last time I had to wrestle (literally) with this issue, I was finally able to get the strap to loosen but it took about 20 minutes, a lot of effort from both the parent and me, and a significant amount of cursing. My thumbs hurt for 2 days after that. But, in the end we avoided having to cut the strap. Good luck! You know how Britax goes on about varying layers of side impact protection. This being on the cheaper and more affordable end my question is, is the shell of the carseat the only part that has the EPP foam? Does the head rest that adjust a tleast have some or is it just a plastic piece with a cover? This concerns me, I know the boulevard advertises that it does, but maybe they just mean more? Can someone please explain this? Karen, the Marathon CT has just the flat headrest. I don’t remember off the top of my head if the back of it is EPP foam or not and it’s in a storage room at the moment. The Boulevard’s headrest is constructed of EPP foam. The shells of the ClickTight seats are blow-molded, which allows energy-absorption. Not exactly a safety question but how/where do you attach the cup holder that comes with some models? I happen to have one and have seen nothing on this anywhere. My son is almost 3 and about 35 pounds. He says the crotch buckle hurts his private. Is there a fix or is there no way to get even close to your 65 pounds worth out of the 2015 Marathon? If he were in the 50 lb range I wouldn’t be so disappointed, but he is barely 50% of the weight advertised. Hi Leo, I’m sorry to hear you’re having issues. Are you using the outer buckle setting? Is he still in diapers or pull-ups? So for the 1 inch below rule for rear facing? Is it from the headrest or shell on the marathon? 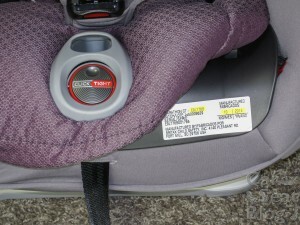 Hi Justina, for all the Britax ClickTight convertibles, it’s 1 inch below the top of the adjustable headrest when rear-facing. HTH! 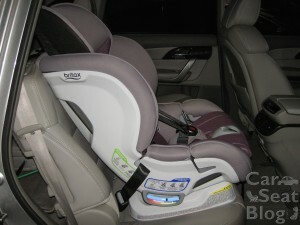 However the official specs mention 18.5″ width (http://www.britax.ca/car-seats/marathon-clicktight/specs). Are your measurements more accurate? Can the Clicktight be used in the center position with a “lap only” seat belt? Brittany, yes, it can be used with a lap-only belt. I’m torn between britax marathon CT and Maxi Cosi Pria 85. My daughter is almost 7 months and over 20 lbs, we are moving from an uppababy Mesa infant car seat and can’t seem to find a convertible I like as much as I like Mesa. Wish uppababy made a convertible already. Not looking to be moving the car seat frequently. Which of the two mentioned above do you think I should go with?